Dr. Darm, Eyelids Before and After - T.C. 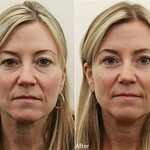 Eyelids surgery (Blepharoplasty) before and after pictures. Results and patient recovery may vary. Aesthetic Medicine is pleased to offer a wide range of plastic surgery procedures performed by our highly-experienced board-certified plastic surgeon. Our overriding goal is to help each patient achieve the overall beauty that they seek. Procedures offered include Facelifts (MiniLift™), Necklifts, Rhinoplasty (noses), Blepharoplasty (eyelids), Breast Augmentation, Abdominoplasty (tummy tuck), Fat Grafting (LipoFill), and several others. We invite you to come in for a complimentary consultation with our surgical professionals to discuss your specific situation and to answer all your questions. For a limited time only, save 20% on all plastic surgery procedures. Schedule your complimentary consultation today!